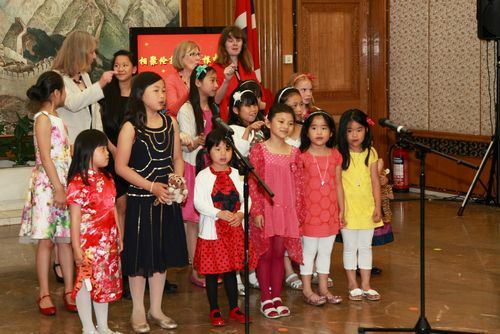 On the evening of 7th June, the Chinese Embassy in the UK, located along the Portland Place, welcomed a special group of clever and neatly dressed little guests who had typical Chinese black hair, black eyes and dark skin but spoke with native British accents. When stepping into the Chinese Embassy, they were all very excited and delighted. Actually, they were adopted Chinese children from all around the UK, who share the same experience of being 'born in China and brought up in Britain'. That evening, they were the guests of the reception with theme of Gather in London, and Remember China held by Ambassador Liu Xiaoming and Madam Hu Pinghua. They were here with their parents, relatives, friends and Mr. Kieron Wilkinson, chairman of the organization, Children Adopted From China (CACH), and Mrs. Wilkinson. 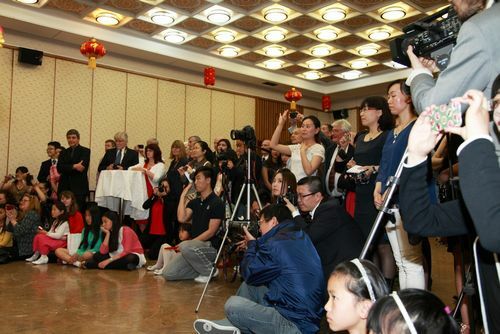 At 18:30, the reception started on time at the hall of the first floor in the Chinese Embassy. To begin, Ambassador Liu delivered a passionate speech. 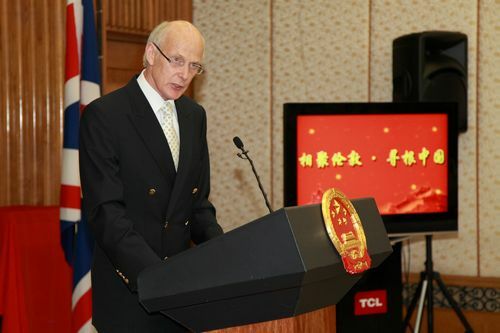 He warmly welcomed the children "home" who are "born in China but brought up in Britain". He said, "China, your country of birth, has not forgotten you. Your birth in China means you will always be part of the whole Chinese family. Family in China has always been very important. So, China will always welcome you. This means you will grow up belonging to two families, and the love you get is also double in size! You must understand that your motherland is a great country. It is a land of cute pandas, beautiful scenery and hard working people. It also has a long history of five thousand years, and today has become the world's second largest economy. China is a big country and plays an important role in the world. China is also a country to dream and to make dreams come true. You have every reason to be proud of China your country of birth." Ambassador Liu also expressed his hope for all young people and children. He said, "Young people and children I hope you all understand and show the true meaning of gratitude. Always keep in mind how loving and caring your parents are. When you grow up, you should support and care for them in the same way. I also hope you will develop the Chinese spirit you were born with. This can be developed if you learn the Chinese language and study Chinese culture. In this way, with such a cross-cultural background, you will build bridges of friendship between China and Britain." In conclusion, he stressed, "the Chinese Embassy will always be the home for all Chinese children in Britain. The Chinese Embassy will also always help adopting families discover and understand China." The speech given by Ambassador Liu was so touching and earnest that it deeply moved all the children and parents present and received a warm round of applauds. Then, Mr. Kieron Wilkinson, chairman of CACH, made a speech. He expressed his sincere thanks to the Chinese Embassy for arranging such a rare opportunity of an event for the adopted Chinese children and their families. 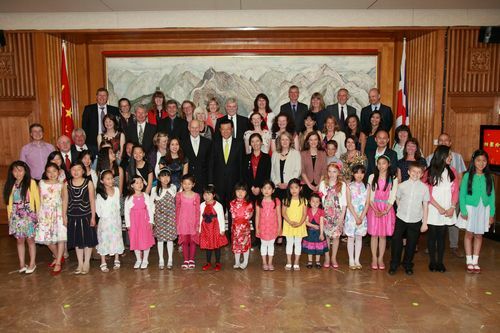 Since its establishment, CACH has helped many British families satisfy their desire of adopting Chinese children and organized regular reunions for family communication, as well as enhanced education of Chinese and Chinese history and culture to Chinese children. "Discovering China" is also the tenet of the organization, hoping that all adopted children will continually pay close attention to and understand China as they grow up. 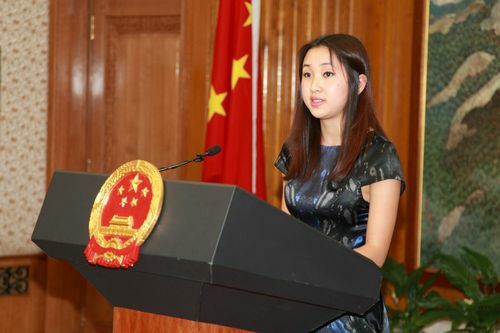 Representative of the adopted children Nena, a 16-year-old Oxford High School student, gave a speech. In her speech, she said that being born in China had a great lasting influence on her life and she had always cared with deep interest about China and wanted to know all of China that she could. This event made her feel at home and inspired her to go back to China to learn Chinese philosophy, history and culture and discover her own roots. 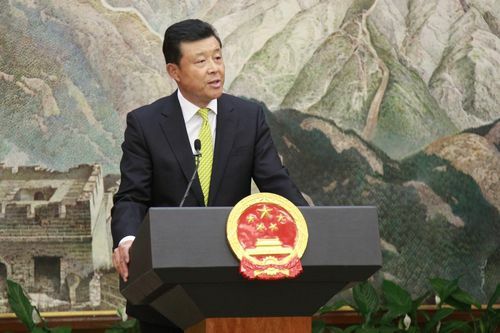 During the reception, Ambassador Liu Xiaoming and his wife held cordial talks with families that had adopted Chinese children, asking questions and getting acquainted with the life and studies of these children and their understanding and impression of China. 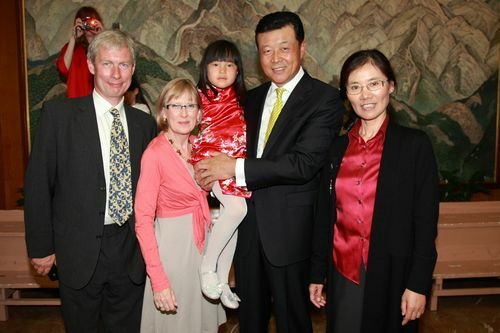 Ambassador Liu Xiaoming and his wife also took pictures with them. Then there was the talent show and games. 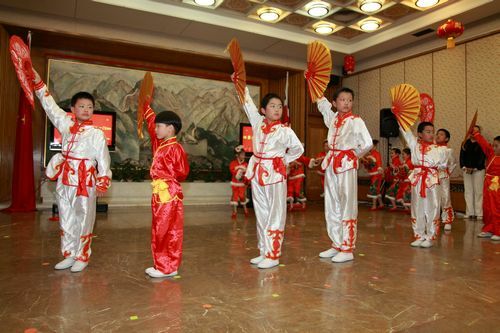 As the little hosts of the evening event, children from Sunshine School of the Chinese Embassy performed for all the guests a wonderful Chinese Kung Fu dance Huo Hong De Ri zi (fiery red days), winning loud cheers. The little guests coming from afar, with no sign of weaknesses, demonstrated their best skills such as a brilliant clarinet solo and a violin solo. Their parents also sang Two tigers (Are You Sleeping Brother John) in Chinese with them. In the atmosphere of familiar melodies, the hall burst into applause and laugher. The little guests were no longer shy anymore and soon played well with children from Sunshine School of the Chinese Embassy. After this, an activity of games began. 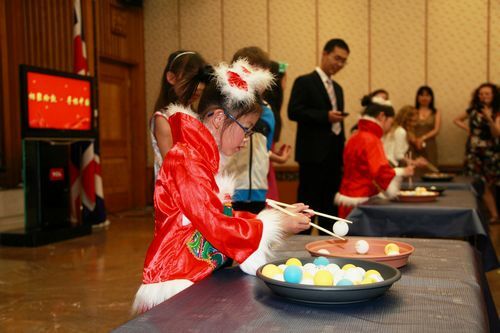 Children first took part in a special contest: using chopsticks (invented by China) to move Ping Pong balls (invented by Britain) from one plate to another. All children were so concentrated on playing the game, doing their best to win the prize. 12 players, divided into four groups, participated in the game one after another and new personal records were constantly created, and cheers and acclaims burst from the crowd time and time again. Finally, there was a quiz game in which the host raised a series of questions regarding Chinese culture and history. "What animal people usually use to describe the Chinese nation?" "Pandas", "Cranes", "Dragon"! Children raced to tell their answers. "The Chinese people are called descendants of the dragon, so the last one has the right answer." The host announced the result and gave the prize to the child. "In which year was the Beijing Olympic Games held? ", "Who can say your favorite Chinese dish in Chinese? ", "How many pandas are there in Edinburgh zoo? "… The host raised a series of questions and children strived to be the first to answer the questions, with the hall resounding laughter and applaud. In conclusion, according to the tradition of overseas Chinese, people began making rapport with fellow countrymen. The Chinese Embassy learned that those little guests were from Jiangsu, Anhui and other eight provinces and then specially arranged diplomats from the ten provinces to the spot. Children took photos with their fellow countrymen diplomats, hard to say good-bye. Good time always flies. As the people left, they promised to get together the following year during. The evening's meeting will always be remembered by every child. Memorable was the performances, games and feast, but most memorable were the new friends and fellow countrymen whom they had met, and the new understanding they had gained of their homeland and cultural roots.